Place ingredients in the blendtec in the order they are listed. Press the “smoothie” button and blend. 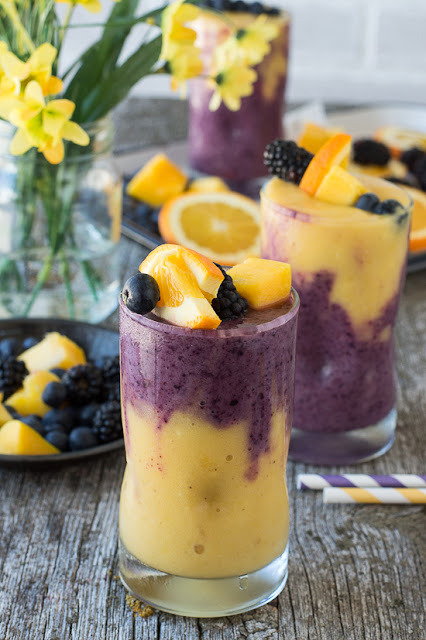 Add more orange juice while the smoothie is blending if it’s is too thick. Place ingredients in the blendtec in the order they are listed. Press the “smoothie” button and blend. Add more milk while the smoothie is blending if it’s is too thick. Layer the smoothie mixtures in glasses. Use a butter knife or popsicle stick to create designs inside the glass. Top each smoothie with a toothpick filled with fruit.